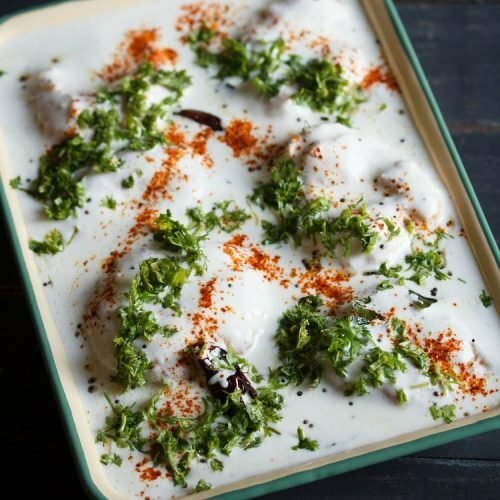 thayir vadai is the south indian variation of dahi vada and is spiced and sour to taste. rinse 1 cup urad dal a couple of times in water. then soak the urad dal in 2 cups water overnight or for at least 4-5 hours. later drain all the soaked water. add the urad dal in a grinder jar. grind to a smooth fluffy batter. if possible, then do not add any water while grinding. if not able to grind, then add 2 to 3 tablespoons water. if the batter has a medium consistency, then its difficult to shape vadas. so the batter has to be thick. take the ground batter in a bowl. add 1 green chili (finely chopped), 2 teaspoons chopped curry leaves and 1 teaspoon finely chopped ginger. briskly & vigorously stir the batter for a minute or two with a spoon or spatula. this makes the batter fluffy and light. as a result you get softer and porous vadas. however the vadas should not be very light or fluffy as then they break in curd. heat oil for deep frying in a kadai or pan. check a small portion of the batter and if it comes gradually and steadily, the vadas can be fried. now wet your palms with water and take some batter in your right palm. with the help of the left hand, shape the batter first. then make a hole in the center with a thumb. gently slid the doughnut shaped vadai into medium hot oil. if you are unable to make the doughnut shaped vadas, then use a spoon and drop the batter in medium hot oil. make other vadas this way and then add them to the kadai. you can fry the number of vadas depending on the size of your kadai. when the base is light golden, turn over with a slotted spoon and continue to fry the vadas. turn over a couple of times and fry the vadas till they are crisp and golden. continue to fry the vadas in batches till crisp and golden. drain the medu vadas on kitchen paper tissues to remove excess oil. when they are still hot, add the vadas in warm water and let them soak for 15-20 minutes. in a small chutney grinder jar, add ¼ cup fresh grated coconut and 1 green chili, roughly chopped. add 2 to 3 tablespoons water and grind to a smooth paste. keep aside. in another bowl, take 2 cups chilled curd. add salt as per taste. with a wired whisk mix and whip the curd till smooth. now add the ground coconut+green chilli paste. mix again very well. check the taste and add more salt if required. heat 1 tablespoon oil in small pan or tadka pan. when the mustard seeds finish crackling, then add 6 to 7 curry leaves, (chopped or whole) and 1 dry red chili (broken and seeds removed). mix well and fry for a few seconds till the red chilies change color. do ensure that the red chilies do not burn. now add the tempering mixture in the curd. after soaking the vadas will soften, increase a bit in size as well as their color will change. press each soaked vada between your palms to remove water. gently press or else you might end up breaking them. press all the soaked vadas this way and arrange them in a platter, tray or bowl. pour the tempered curd (thayir) on the vadas. allow the vadas to absorb the curd for minimum of 30 minutes or for a few hours. if keeping for 3 to 4 hours, then cover and refrigerate. before serving, sprinkle some red chili powder on top. then sprinkle some finely chopped coriander leaves. you can also add some masala boondi on top. grated carrots and roasted cumin powder can also be added. serve thayir vada. leftover thayir vadai can be refrigerated.